For those that would like a short and precise review – it’s probably the best all-round recreational/technical dive computer on the market and I wish I’d bought one sooner. 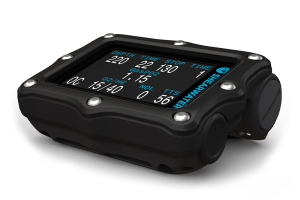 The longer review with more detail – first off, if you’ve ever been on a dive boat with technical divers you’ve probably seen them sporting some form of Shearwater computer or something extremely similar in nature & design on their wrists. That tells you they make equipment that people pushing the boundaries of diving put their faith in to help keep them informed and alive. That said you don’t need to be a technical diver to get the best out of the Perdix. This is a computer that will expand its functionality as you expand your training and level of technical skills. It will not flood you with options that you don’t need to wade through. There are multiple modes from open circuit recreational, to more technical versions of open circuit which can handle Trimix, all the way through to closed circuit/bailout for technical rebreather usage. With the computer in recreational mode the first thing that you’ll notice, as you press both side buttons, is the screen…it’s bright, clear, has a clean layout, colour where needed. I’ve dived with a selection of dive computers from pucks, SPG integrated and wristwatch computers with LCD and colour screens but none have come close to how bright and easy to read as the Perdix is. Going back to the buttons, they aren’t buttons but are sensors that detect when you apply pressure, one on each side. That means they work with very thick gloves and are very easy to handle with the thumb and first or middle finger. These buttons along with the simple nature of the interface methodology means that you can see the screens and information that you want quickly. The layout of the screens can also be adapted to introduce or remove information and have what is important to you right there on the home screen. Once in the water the Perdix reduces the options for making system changes etc and the interface is focused on the job at hand so the number of button presses reduces and so does your task load on getting information you need in front of your eyes. The Perdix air integration (AI) part of the system works extremely well, it doesn’t need to pair each time you turn it on…. you enter the transmitters serial number into the Perdix and that’s it. It gets the pressure readings extremely quickly and for me the ability to have two transmitters showing on one screen when I sidemount is just brilliant. I personally have the transmitters on short high-pressure hoses, the transmitters are a lot less likely to get damaged. The Perdix also has the first digital compass I’ve ever used that actually is good at its job, I’d say it’s better than a proper compass, not just better than the usual digital compasses. It really works in all planes, upside down, vertical, you name it, it just works. Setting a bearing is simple and once done you get a nice green indicator on that bearing and a red one on the reverse…but the best bit is that it then shows how many degrees you are away from that bearing. Never will sticking to a heading, doing expanding box or “U” shape search patterns ever fox you again. I do a lot of diver assists and training in Lake Pupuke, where the visibility conditions can range from “mildly crap” to “I can’t see my torch”, what I can always see is the Perdix screen and its compass. The battery is user replaceable AA’s so never a problem to source. In the box comes all the little extras that show someone has put thought into their product, Bluetooth dongle (not actually needed but helpful if you don’t have Bluetooth on your PC), spare o-rings, two methods of strapping (nice thick elastic straps/rubber tubing), screen protector already installed etc. Shearwater upgrades their features, as an example since I purchased they have enhanced the dive logging screens to show start and end pressures…great for filling out those dive sheets. The Bluetooth transmitting function means no extra USB cables to purchase or lose. It doesn’t beep… so you won’t be sounding like you’ve left your phone on in the cinema underwater. Its method of alerting you is colour and background changes, i.e. be aware that you are close to a limit and then flashing colours and background changes along with messages that need to be confirmed when you breach a safety or self-imposed limit. If you rely on your dive computer to beep at you to tell you something is wrong then you probably need to look at your computer more often . Any downsides? Not any major ones, it’s not a small watch on your wrist so you won’t be taking it to parties to impress people with. It’s also not the cheapest dive computer, but for the functionality and shea rability for me to understand the situation I’m in at any point in a dive then it’s worth the money. I look at the cost in the way that if I had bought this earlier and when I first was introduced to the Shearwater computers I would have saved myself quite a bit of money by not buying other dive computers that I struggled with. Summary: It’s so good after using it on a few deep challenging dives I went and bought another one for my wife to dive with because I felt it was that important to have a good robust kit that just worked exceptionally well. Special Offers Auckland, Auckland Scuba, Diving, New Zealand Review, Perdix, Scuba, Scuba Diving, Shearwater. permalink.